Hello and welcome. My name is Matthew Buxton from 8 Elements Inc. and I'm going to help you fore fill your dream of being the owner of a fantastic business. This page is where you can directly access my How To Buy A Business online course. First I'd like to explain why I created this course for you. I created this course as a means of helping everyone who dreams of owning their own business. I created this course for men, for women, for couples and for those of you new to Canada who are looking to buy a great business opportunity for a great price. I created this course for all of you who are sick of working for that psychopath, nut job or for that bureaucratic corporation that is literally sapping the life out of you - because I’ve been there. I created this course because I’ve seen far too many people burn through their hard earned savings just looking for a business to buy. Worse, I’ve come across far too many people who lost their entire life savings because they ended up buying the wrong business! I believe far more people would buy a business if only they had access to a resource that showed them exactly what steps they had to take. A resource that could show them the most cost effective way of identifying and buying a business. A resource that was written by someone with “hands-on” experience. So having been through the business buying process myself, hundreds of times, I chose to create a course specific to buying a business in Canada, as a means of helping others. 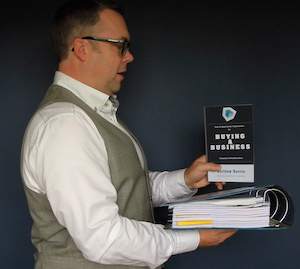 The content of my course is based on my experience as a seasoned Business Broker, a Business Broker who is passionate about helping people just like you, who dream of owning a business. The content is a culmination of years of experience working one on one with hundreds of different buyers and sellers, as well as my experience working directly with lenders, lawyers, accountants, landlords and other industry experts. It took me the better part of 2 years to create this course because I wanted it to be the very best resource available for anyone looking to buy a small to medium-sized business. I continue to this day to refine and polish it. While my passion is helping and consulting with other people across Canada, who are looking to buy a business, I remain an active business broker in Calgary, Alberta. After all, it’s my experience as an active business broker that allows me to advise you and ensure my course reflects the very latest information and advice possible. My course takes a common sense approach to buying a business in Canada. It’s a course that can be applied to any type of small to medium-sized business, in any industry. From those of you with no business owner experience through to those of you that do have business owner experience, this course is designed to save you time and it is designed to save you thousands of dollars. If you are looking to buy a business, my course will teach you how to identify and buy a great business for a great price and in a way that gives you the greatest probability of success. All you need to do is dedicate the time and effort needed to apply what I've taught you. The best part is, at anytime throughout the business buying process, you have access to me, a seasoned business broker who genuinely cares about your success. (If you end up needing more one on one help than you thought, additional Consulting time can be purchased separately. Please don't hesitate to call me for more details). If you are serious about wanting to buy a business, I will show you exactly what you need to do – what you have to do – in order to identify and buy a great business opportunity.